Hiring a Realtor to assist in your home purchase is truly a no-brainer: you enjoy access to all manner of tools and benefits that make your search easier and more successful, yet, in a typical real estate transaction, the buyer’s Realtor fees are paid for by the seller . Thousands of clients have trusted us to help buy their first homes, their next homes, and their forever homes, and have counted on our more than 50 years of combined experience to get it done right. Help you identify what you must have, and what would be nice to have, in your new home. By prioritizing your wish list, we can help choose the best home on the market for your family. Coordinate your pre-qualification process. We can put you in touch with a lender to pre-qualify you for a mortgage. Knowing your financial position will help narrow down your search. Give you access to extended property information. You can view and sort through detailed property information online, beyond what’s available to the general public, receiving email notification whenever changes occur to listings within your search criteria. Organize home showings at your convenience. We’ll help you select the right homes to view, and arrange showings that fit your schedule. As soon as a property hits the market, we can show it to you. Compose an easy-to-understand offer, advising on the most reasonable terms and conditions to include. In the excitement following the discovery of your perfect new home, we’ll make sure nothing is missed when it comes time to draft an offer. We’ll work closely with you to be sure whatever terms and conditions you need - including time to arrange financing, building inspections, and appraisals - are included. Represent you during negotiation of the offer. Our knowledge and experience are invaluable when it comes time to negotiate your offer. Taking into account market conditions, how long a property has been listed, and its amenities, we will help ensure you don’t pay more than you have to. Help arrange financing. The right financing can save you thousands, or tens of thousands, of dollars over the life of your mortgage, and our longstanding contacts do the best they can for our clients. Organize a building inspection. We have long believed that a proper home inspection is an absolute necessity when purchasing a home. A qualified inspector will scrutinize all areas of the house’s interior and exterior, both structurally and mechanically, providing you with a written report indicating areas of concern and the estimated cost of repair. Coordinate other professional services. Through the years, we have built up strategic alliances with a wide range of professionals, including real estate lawyers, movers, mortgage brokers, appraisers, and builders. 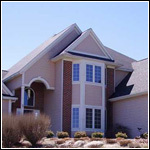 As part of your transition into a new home, we can coordinate all required services. Sound good? Contact Ryan & Dennis today to get started.